Celebrate AG is over for year number two of our Granges serving breakfasts and lunches to many hundreds of hungry folks, many farmers and you must know how they can eat! We did add a healthy profit to our treasury and once again donated $500.00 back to the Celebrate AG all volunteer committee! We sadly accepted the resignation of Sue Griffiths as our Greeter but new youth member, Evelyn Dexter was elected and installed to fill that position. We voted to let Joyce Jordan use our facilities for a fundraising supper for the Sterling United Protestant Church, which is struggling to maintain its historic Church with an aging congregation (sadly, this sounds like too many Granges). 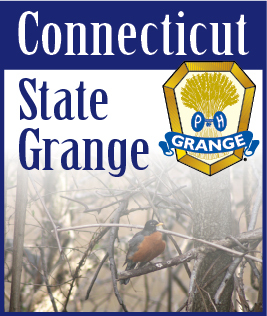 We ended up donating a total of $297.00 in “C” and “G” bills to the State Grange. Thanks to all who contributed! Paulette Craig gave us an update on her granddaughter who was born with cystic fibrosis. Specialists in Pittsburg, PA determined that she remains strong enough to not yet need a lung transplant. She is now 24 years old and has 33% lung capacity. Nov. 1st we have a special program, “Raptor ReHab”. Richmond Grange has been invited to join us for a soup and sandwich supper, followed by the program and then our regular Grange meeting. Several Subordinate and Juniors will be attending part or all of National Grange session. We are extremely proud of Junior President, Lillian Sharpe, who is representing CT as Junior Ambassador and vying for the National title. Nov. 17th will be our annual Turkey Supper and December 1st our Christmas Bazaar!